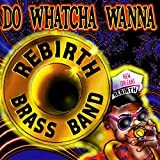 The Rebirth Brass Band is a New Orleans brass band. The group was founded in 1983 by tuba/sousaphone player Philip Frazier, his brother, bass drummer Keith Frazier, and trumpeter Kermit Ruffins, along with other classmates and marching band members from Joseph S. Clark Senior High School, which Firstline Schools will be closing in the spring of 2018, in New Orleans’ Tremé neighborhood. The band released its first album in 1984 on Arhoolie Records which was recorded in the Grease Lounge, a Tremé neighborhood bar, and in 1989 gained wider notice with a series of releases on Rounder Records. In 2012, Rebirth won the Grammy Award for Best Regional Roots Music Album, the inaugural year of the Grammy category. The band also performed in the Pre-Telecast ceremony for the 54th Annual Grammy Awards.